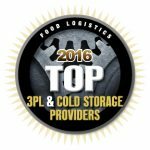 HICKORY, NC (August 22, 2016) – Transportation Insight, a leading global third-party logistics (3PL) provider, has been selected as a Top 3PL & Cold Storage Provider by Food Logistics magazine for the fourth consecutive year. The annual list showcases providers who continue improving their expertise to offer clients state-of-the-art transportation management solutions, the latest temperature monitoring technologies and warehouse management systems. Transportation Insight was selected for its multi-modal Enterprise Logistics solutions that encompass robust technology applications, big data solutions, supply chain analytics, streamlined operational processes and proprietary continuous improvement methodologies for the end-to-end supply chain. The 2016 Food Logistics Top 3PL & Cold Storage Providers list is a valuable resource for transportation decision makers, giving them a snapshot of the capabilities of the listed companies and the geographic region(s) they serve. The companies on this year’s list improve their expertise with best practices and deep industry knowledge and maintain their leading-edge offerings that drive value through clients’ supply chain networks. Transportation Insight’s robust Enterprise Logistics solution addresses many of the key challenges clients face, such as capacity issues, government and industry regulations and rising operational costs. From expanding in new markets to managing risk and giving visibility across the entire supply chain, Transportation Insight empowers clients with superior solutions and more than 500 years of executive logistics experience. With the enhancement of its parcel platform to include robust audit, optimization and advanced analytical capabilities, Transportation Insight gives clients a Tier One solution across all transportation modes for optimal performance and bottom line improvements. The company has earned a reputation for excellence as a lead logistics provider serving companies throughout the world.